Some taxpayers are receiving advice to borrow against their homes or retirement savings to pay off their tax debts under a new program that has outsourced that collection to private companies. The Internal Revenue Service has contracted with four debt collectors in the congressionally mandated privatization program, one of which has engaged in the aggressive tactics. The controversial methods deployed at the nascent program -- first reported by The New York Times -- caused alarm bells to sound at consumer and employee advocacy groups, as well as among Democratic lawmakers, despite assurances from the IRS that there is no cause for concern. Four Democratic senators sent a letter to Pioneer -- one of the four contracted debt collectors used since the program launched in April -- on Friday to express their concern with the scripts its employees are using when speaking to delinquent taxpayers. The company may be “pressuring taxpayers into risky financial transactions” and failing to protect them from “criminals posing as IRS agents,” the senators said, which could violate federal statute and contract provisions. Pioneer employees are using scripts that advise taxpayers to turn to “money sources” including credit cards, a second mortgage and a 401(k) loan, which the senators said could “dramatically increase expenses, or cause them to lose their homes or give up their retirement security.” The lawmakers noted the contractors are required to refer taxpayers claiming an inability to pay their debts back to the IRS for negotiating terms of repayment, but Pioneer did not appear to be taking that step. In a statement, IRS defended the practices. “The IRS will be closely monitoring the private debt collection program and will be working closely with the firms to ensure the fairness and integrity of the initiative,” it said. Patricia Christel, a spokeswoman for Navient, Pioneer's parent company, also said it had done nothing wrong. "Pioneer has followed all IRS protocols in working with the Internal Revenue Service to recover millions of dollars in taxes that have gone unpaid for years," Christel said. "Pioneer has satisfied an extensive list of IRS-conducted audits and tests, encompassing all facets of the program including receiving approval from the IRS on all scripts and procedures." Congress voted to privatize tax collection in 2015, despite two previous efforts to outsource the work before bringing it back inside the government. IRS most recently awarded contracts for outstanding debt collection in 2006 before canceling the program in 2009 amid findings the agency was spending more money than it was collecting while employing overly aggressive tactics on vulnerable populations. At the time, lawmakers from both parties -- such as Sens. Chuck Grassley, R-Iowa, and Chuck Schumer, D-N.Y. -- defended the program, saying bringing it back in-house would cut jobs in their states. In the more recent debate, lawmakers noted debt collection had fallen in the years before they passed the reform. The Treasury Inspector General for Tax Administration found in a 2013 report the revenue collected by the IRS from tax enforcement dipped 13 percent between 2010 and 2012. In that time, the IRS shed 8,000 positions, 5,000 of which were front-line enforcement personnel. 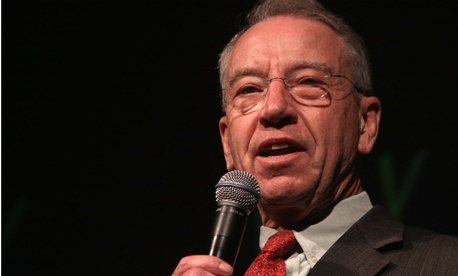 Grassley, who helped lead the charge in bringing back the outsourcing program, continued to defend the privatization and said critics were politically motivated. The National Treasury Employees Union, which helped spearhead previous campaigns to dismantle the privatization, was quick to frame Pioneer’s methods as evidence private companies were too insensitive to carry out work better suited for federal civil servants. IRS’ own employees generally have more flexibility than contractors to set up flexible payment schedules and to negotiate a reduction in debts owed, among other potential compromises.